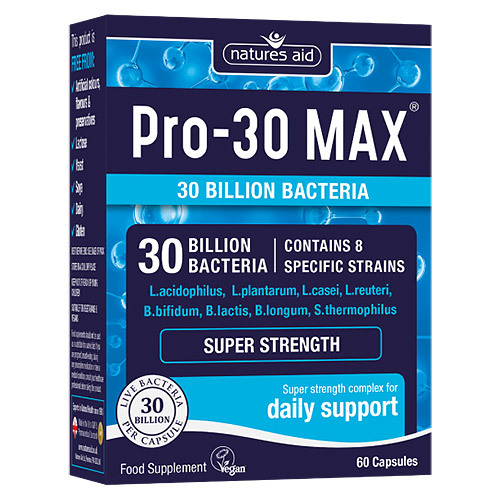 Natures Aid Pro-30 MAX is a daily complex containing 8 extensively researched strains of bacteria; L. acidohpilus, L. plantarum, L. casei, L. reuteri, B. bifidum, B. lactis, B. longum and S. thermophilus providing 30 billion live bacteria per capsule. Pro-30 MAX has been specially formulated by bio-chemists and nutritionists based on scientific research. Microcrystalline Cellulose, Lactobacillus acidophilus, Lactobacillus plantarum, Lactobacillus casei, Lactobacillus reuteri, Bifidobacterium bifidum, Bifidobacterium lactis, Bifidobacterium longum, Streptococcus thermophilus, Maltodextrin, Vegetable capsule shell (Cellulose), Anticaking Agents (Silicon Dioxide, Vegetable Source Magnesium Stearate). Adults and children aged over 12 years: Take 1 capsule per day with food. 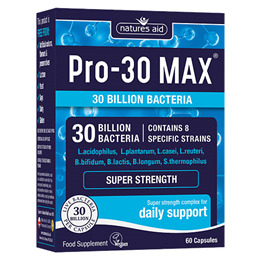 Below are reviews of Natures Aid Pro-30 MAX - Daily Support - 60 Capsules by bodykind customers. If you have tried this product we'd love to hear what you think so please leave a review. This product is very good. It certainly helps with my digestion issues and keeps my stomach settled. I would not like to be without it ..... will continue purchasing.